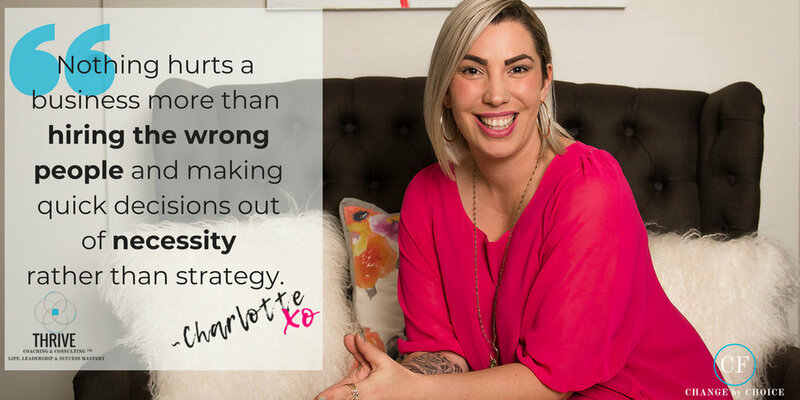 I have a lot of different roles within my work; I’m a High Performance Coach with my online brand, Change by Choice. I’m also the owner of my business, Thrive Coaching and Consulting and I work directly with businesses on their communication, human resources, productivity and hiring/recruitment. I do workshops and also consulting work based on the needs of the organization. One thing that comes up so much (and actually is a passion of mine) is recruitment and hiring. If you’re a business owner, whether it be brick and mortar, online, MLM…you’re going to definitely want to keep reading. If you’re not? You should also keep reading….because truthfully, the hiring framework that I’m going to go over can be applied to how you choose a partner, how you choose your friends, how you choose who is going to babysit your children, how you choose a contractor to renovate your home. I speak specifically in regards to hiring an employee for a business, but you can take the same principles and really apply them to all areas of your life. We all know what happens when we have the wrong people in the wrong roles within our teams (or our lives). We all know what having high turnover does for the health of your business (not to mention the time and money it costs you). So how can you start to level up this process? How can you start to be more strategic and really hire effectively? So that you create a team that’s fulfilled, that’s happy and that’s committed to the success of your business? In the latest episode of the Change by Choice Show, I’m going to walk you through the hiring framework that I implement and train businesses on. And I want you to really analyze what you’re currently doing when it comes to hiring, where the gaps are and where you can start to make some changes. Nothing hurts a business more than hiring the wrong people and making reactionary decisions when it comes to hiring. If you’re the one doing the hiring, it really tests your leadership. If it’s not you who’s doing the hiring within your business, you are still accountable to it. You need to make sure that the person responsible is following this framework as well. Why is this so important? Because taking someone on into your organization is a huge responsibility. It’s not a place to feel entitled. We should feel genuine pleasure and honor to have people want to work for us. We get a huge portion of their time in their lives and we really have to be responsible and mindful of how we show up with them and how we set them up for success. We are talking about people’s lives here; the highest amount of responsibility should be taken here. In these roles, we impact how people are in their lives, how they show up for the world and for their families. Do you want your people leaving work feeling completely unfulfilled, unhappy and stressed and carrying those emotions back home to their families? It’s also important because your team is your strongest asset and when you really treat them that way, they are going to give so much and you’re going to receive the benefits of that long-term. Your business is going to thrive when you have people who are passionate, innovative and committed to the growth of the business. The health and happiness of your staff and your team ends up being the health of your clients and the health of your business. You should want to not only have a profitable business, but one that has a great legacy in terms of how they treat people. This is two-fold; you need to make sure that you are bringing a high bar standard to the table and that you’re looking for that high quality person on the other side. Here is where you really need to be asking the right questions; what level of quality can they produce? What examples have they shown in the past? I’m also making sure I am sharing what they can expect with full clarity. Hold a high bar when it comes to what you’re asking, what you’re communicating and hold them to a high bar in terms of what you’re looking for. Intuition is huge. You’re going to receive lots of information in this process; from their resume to the answers they give in the interview to what you see and what you hear. You really have to trust what your intuition is telling you. Are you excited to talk to them? Do you want to work beside them? Ask yourself those questions. Are they the perfect fit on paper, but something just doesn’t feel right? Trust your intuition. You want to make sure they aren’t just a good technical hire, but it’s also somebody that fits beautifully into the team. Based on the information that you’ve gathered, give yourself some time to analyze how you feel about it. Give yourself some time to really reflect. Too often people make off-the-cuff, quick decisions because they have to, not necessarily because it’s the right thing to do or the thing choice to be make. Really be mindful here and reflect on the information you’ve gathered and what your intuition is telling you. If it’s possible, be really proactive here so that you have enough time to do this. A huge part to the success in this process is really educating people on the role, the culture and what is expected of them within the job. It is your responsibility to educate them and give them the clear picture on what they are getting into. This is also their time to gather the information they need to determine if your workplace is the right place for them. It’s important to remember that hiring is a two-way street; it needs to be a right fit for both sides. When you’re so clear with them, there’s no surprises and your chances of hiring in the right person are so much higher. It also incorporates how open the person is to receiving coaching, to learning and being educated once they are in the position. Are they guarded, stuck in their own ways or think they “know it all” or are they excited to learn, want to contribute and be innovative within their roles? Don’t Hire Digital Nomads … Unless They Can Do These FOUR Things For Your Business.